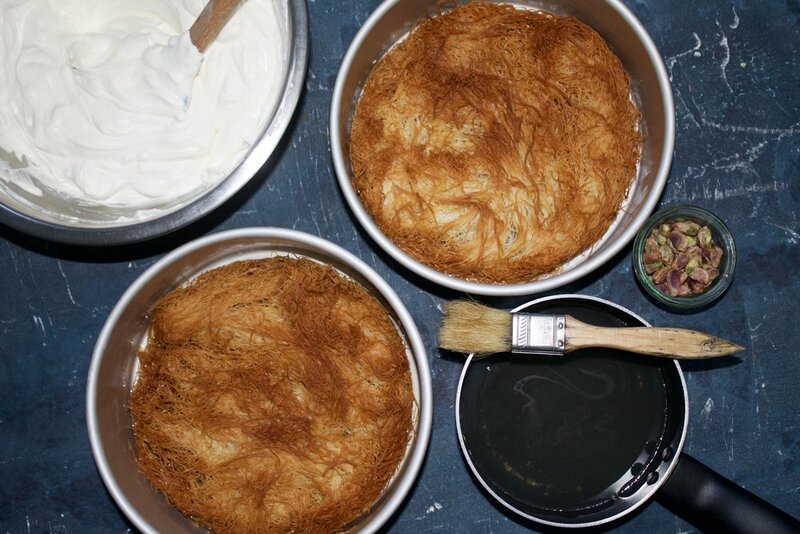 A client recently asked me to make this traditional Lebanese dessert, osamlieh. I was scared at first, but I was also excited to make something new. So, I went to my go-to modern Lebanese cookbook The Jewelled Table, which had an authentic recipe for osamlieh. I added my own twist by mixing orange blossom water from my grandfather, which I brought back from Lebanon. This recipe seems daunting at first (I was too! ), but it’s really simple once you get to the assembly. 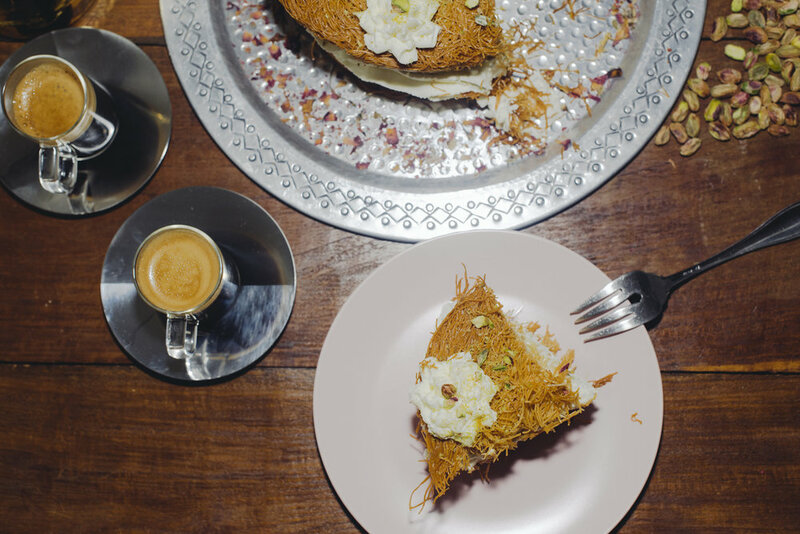 It’s essential to use kataifi, a shredded phyllo pastry, for this dessert. It not only gives the foundation to hold the floral rosewater cream filling, but also adds crispy, crunchy textures to balance everything else. This dessert is definitely a showstopper with little efforts. Defrost your shredded filo pastry for about an hour. Divide the filo pastry into two equal amounts. In two 9-inch round cake pans, fill half cup of neutral oil in each. Spread the bottom of the oiled cake pan with shredded filo. Press down evenly so that the filo pastry is compact and flat. Dot the cubed butter on top of the pastry throughout. Bake them in the oven for 30-35 minutes, or until the pastry gets crispy and golden brown. After 15 minutes, make sure you rotate the pans for even browning. After baking, let them cool in the cake pan for 15- 20 minutes until the pastry is set. Once it’s set with the circle shape, take the dough out from the pan and place them on a wire rack or a paper towel to drain all the excess oil. In a large mixing bowl, whisk heavy cream, confectioner’s sugar, and rosewater until it reaches a medium peak. In a separate mixing bowl, spread & fold the mascarpone with a spatula until it’s silky, and spreadable. Start folding the whipped cream into the mascarpone, 1/3 at a time, until it’s fully incorporated. Put the cream mixture into a piping bag (or a ziplock bag). Place it in the fridge until you are ready to assemble. In a small pot, add water, sugar, lemon juice, and orange blossom water over medium heat. Let it cook for 15 minutes, until the sugar has dissolved and reduced a little bit. Let it cool. Place the bottom half of cooked filo dough on a serving base. Using a star-tipped piping bag, pipe the mascarpone cream on the filo base until it’s fully covered by making a circular motion. You need to do this twice to have two layers. The cream layer should be thick. Place the other layer of filo dough on top of the cream. Press down very gently to make a large cream sandwich. Decorate the top with more mascarpone cream and zested and crusted pistachio. Serve the orange blossom simple syrup on the side. Enjoy a slice with your afternoon coffee.